This Holiday Gift Guide is sponsored by participating vendors and contains affiliate links. Welcome to The Conscious Cat 2017 Holiday Gift Guide – your one stop shopping solution for all the cats and cat lovers on your holiday gift list! This year’s guide features some of the best products for cats and cat lovers on the market. And even better: many of the companies featured are offering exclusive discounts to Conscious Cat readers! Give your cat the gift of premium comfort with a Merino wool Cat Cave from Meowfia. Each cat cave is carefully handcrafted from 100% all-natural wool by artisans in Nepal. Using an ancient fabrication technique called felting, every cat bed is individually molded using only soap, water, and pressure. Completely free from harsh chemicals and synthetics. Safe for your cat, your family and our world. For more information and to purchase, visit Meowfia on Amazon. Pet fountains help your cats drink more water because they are attracted to moving water. The Rainbow™ plastic drinking fountain is extremely easy to take apart and clean, and is dishwasher safe. The attractive design looks like it belongs in your kitchen. For more information and to purchase, please visit http://www.pioneerpet.com. End the kitty versus carrier struggle. Many cats associate travel with negative experiences such as a trip to the vet. The Sleepypod mobile pet bed allows a cat to travel safely in the comfort of its own bed, thereby reducing the stress of traveling to unfamiliar destinations because the Sleepypod is already a trusted part of its everyday life. Plus, there’s no need to buy multiple products because it is three products in one: carrier, pet bed, and car seat. Ultra plush bedding surrounded by a luggage-grade, ballistic nylon base forms a bed that easily becomes a carrier by zipping on its mesh dome. In a car, the Sleepypod becomes a car seat that is certified with a 5 star crash test rating from the Center for Pet Safety. On the road and at your destination away from home, a pet remains in its own bed through the entire journey. For more information and to purchase, visit http://www.sleepypod.com. You’ll love the over-sized base on all Kool Kitty Cat Scratchers. The high quality sisal and dependable materials provide a safe outlet for your cat’s instinctual scratching behavior while keeping claws trimmed and conditioned. Their cat scratchers are handmade and infused with two pockets of catnip! This scratcher is perfect for corners, small homes, and is a huge space saver. Choose from multiple colors. Size: 20″W x 6″D x 25″H (post is 5 inches in diameter.) Made in the USA by disabled veterans, Kool Kitty Toys donates a portion of all sales to animal rescue organizations. For more information and to purchase, visit http://www.KoolKittyToys.com. Kool Kitty Grandma “T” blankets are decorated with the images that must certainly be dancing around in your Kool Kitty’s dreams – mousing, playing, and rolling around in feline bliss – this fleece pet mat will brighten up any room and provide a wonderful napping spot for your kitties. Sized 27″ x 17″ Inches, all mats and blankets are machine washable and dry-able. Made in the USA by disabled veterans, Kool Kitty Toys donates a portion of all sales to animal rescue organizations. Nature’s Secret Remedy manufactures quality, easy to clean, BPA free commercial vinyl cat litter mats in brown or grey and in small and extra-large sizes with an adorable cat logo on each mat. This holiday season, they are discounting two of their best-selling mats. Both the extra-large grey rectangular mat and the extra-large half- moon mat are 10% off this holiday season. Regularly priced at $19.95, you can purchase them for $17.95 with Amazon Prime free shipping. These cat mats are rolled, never folded, and have no ugly wrinkles or creases when you receive your product. They are contained in a thick cardboard box to protect the mat at Amazon’s warehouse and during transit. For more information and to purchase at the 10% discount, visit http://www.bargainpurchases.com. The new Primetime Petz Lounge offers a spacious raised lounging surface, perfect for cats or small dogs. A reversible fabric hammock easily attaches to the sturdy wood frame creating a suspended bed that molds to your pet’s body shape. The lounge is easy to assemble and easy to keep clean with a sleek modern look. Lounge surface measures 21” x 21”. Suitable for cats or small dogs up to 20 lbs. Hammock can be machine washed and dried. For more information and to purchase, visit Hauspanther.com. Love cats? Love wine? Then the Hauspanther Wine Lover’s Combo is for you! Includes three fun wine cork cat toys packaged together in a color coordinated plastic wineglass, perfect for gift giving! Each wine glass includes one Bamboleo Crocheted Wine Cork Cat Toy From Hauspanther, one Bunny Faux Fur and Wine Cork Cat Toy from Tiger Teasers and one Thunderbolt Wine Cork and Yoga Mat Cat Toy from Feline Yogi. Our Wine Lover’s Cat Toy Combo comes in four colors: purple, blue, green or red. For more information and to purchase, visit http://www.hauspanther.com. Skillfully and carefully handcrafted, Wet Whiskers Fountains are some of the finest fountains for your cat to enjoy. Each fountain is made using qualified safety standards and contains no toxins, heavy metals or unsafe plastics. Like the unique personalities of your cats, these fountains are unique and stylish, but extremely functional. Quality stoneware keeps the water cool and clean longer. Veterinarian recommended, the fountains are easy to assemble and clean. For more information and to purchase, please visit Wet Whiskers Fountains on Etsy. Exclusive 10% discount plus free gift for Conscious Cat readers: mention The Conscious Cat when purchasing. Valid November 5 through December 24, 2017. Pet Acoustics is clinically proven to reduce stress and calm cat behaviors, solving environmental stress, thunderstorm nerves, nocturnal activity, and is ideal for grooming, transitions and litter training. It is portable for travel.For a limited time, Pet Tunes Bluetooth® speaker (pre-loaded with frequency-modified music for felines), comes bundled with Jingle Tunes, an additional collection of 11 calming holiday tracks on a 1 GB Micro SD Card. For more information and to purchase, visit http://www.PetAcoustics.com. 15% discount, originally priced at $89.94, now $74.99. No code required, offer good for a limited time only. Travel with ease with a Carrier Cozy® – the patented fabric enclosure for your pet carrier. It turns that hard and cold carrier into a safe, inviting place that your pet will love while traveling and at home. A Cozy provides protection from inclement weather, loud sounds, bright lights and all of the other unfamiliar and stress-inducing elements of the outside world that so easily scare our house pets. At home, the Carrier Cozy® provides a peaceful place for your cat to relax and escape a drafty room or cold floor.Carrier Cozys® come in 4 basic sizes in a variety of colors and fabrics, turning any carrier into a stylish transport. These handmade Cozys® can be customized for any size carrier, and they can be personalized, too. For more information and to purchase, visit http://www.carriercozy.com. Exclusive 15% discount on your entire purchase for Conscious Cat readers: use code CONSCIOUS17 at checkout. Discount expires January 31, 2018 (shipping excluded). Georgia’s Gifts offers a wonderful and varied selection of cat themed gifts, decor and fashion accessories for holidays and every day. 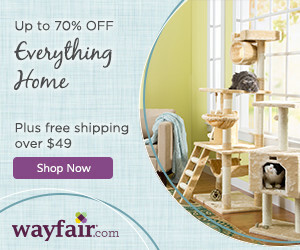 Browse items such as kitchen linens & mugs, cat pillows, accent rugs and ceramic tiles for your home decor. Unique & whimsical gift ideas include handbags & wallets, sleepwear, slippers, socks, plush and ceramic cats, and much more, all with delightful cat designs. For more information and to purchase, please visit visit http://www.GeorgiasGifts.com. Exclusive 15% discount for Conscious Cat readers: Use coupon code CCHG15 at checkout. Offer good through December 2, 2017. Handcrafted Cat Gifts for the cat lover in your life. Many ready to ship cat Oonaments, tree toppers, desk accessories, feeders and paintings. Custom Cat Art of your cat starting at $64.95! For more information and to purchase, visit http://www.KittyCatStudio.net. Exclusive 10% discount for Conscious Cat readers: use code CCAT10 at checkout. Valid through December 4, 2017. Triple T Studios creates and curates uniquely designed handbags and accessories with feline finesse. Shop our cat inspired handbags, jewelry, scarves, and cat toys. New this holiday season, our Cat Chain Link Necklace, Cat Nap Pearl Cage Necklace, Happy Cat Handbags, and Vanishing Species Collection. Triple T Studios donates to global conservation projects including Lion Guardians Project, The Cheetah Conservation Fund, Panthera, and select domestic cat non-profit organizations. For more information and to purchase, visit http://www.triple-t-studios.com. Exclusive 20% discount for Conscious Cat readers: use code ConsciousCat20. Code does not expire. Creating a very personal, private homage to all things Cat amassed over the course of more than 30 years, Sandy Lerner has meticulously collected tangible expressions of the special love between cats and their humans. A joyous and intimate journey through the cats of art, prose and poetry, and, of course, the cats of the taste makers and amateurs from the ancient Hittites to Picasso and Giacometti. Caticons celebrates 4,000 years of Art Imitating Cats. It’s back by popular demand: The 2018 Conscious Cat Wall Calendar is now available for purchase! Allegra and Ruby spent hours picking out just the right photos, and they made sure that they received equal representation. To my knowledge, this is still the only calendar on the market that exclusively features tortoiseshell cats. Click here for more information and to purchase. Keeping your cat’s nails trimmed is an important part of keeping them healthy, while protecting your furniture and yourself. Trimmed nails are also less likely to catch on rugs and carpets, which can lead to a painful broken claw. Nail trimming is dreaded by many cat owners, who resort to expensive visits to the vet or groomer. Zen Clipper makes nail trimming at home easy and fool-proof. Zen Clipper ensures only the tip fits into the specially designed blade, ensuring you will clip the tip while avoiding the quick. There are seven sizes of Zen Clipper, most adults cats use Zen Clipper #2 (medium). If in doubt as to which size you need, Zen Clipper will be happy to mail you a free sizing card. 100% money-back guarantee and free exchanges if you need a different size than purchased. For more information and to purchase, visit http://www.zenclipper.com. Exclusive 20% discount for Conscious Cat readers: use code CCAT20 at checkout. Valid through December 25, 2017. Cats are people, too. And who could deprive any human being of their civil right to a pumpkin spice latte during sweater weather? Not The Honest Kitchen. That’s why they created this warming elixir of goat’s milk, pumpkin, honey, and aromatic spices so that kitty can curl up with a latté of their own instead of just staring longingly at yours. And for the kitty who attacks your Christmas tree, there’s now an alternative way to “celebrate.” The Honest Kitchen’s instant eggnog will reward your kitty’s one-track (treat-track) mind. The ingredients are simple: goat’s milk, honey, eggs, and warming cinnamon. The resulting holiday spirit? Equally simple: more of the “peace and quiet” variety. For more information and to purchase, visit http://www.thehonestkitchen.com/pumpkin-spice-latte and http://www.thehonestkitchen.com/eggnog. Is your older cat having difficulty jumping down from their favorite perch? Or having trouble going up and down stairs? Are they excessively grooming any of their joints? If so, your cat may have arthritis. Arthritis is very common in cats over the age of 6, and becomes even more prevalent as they age. In fact, 90% of cats over the age of 12 are believed to have arthritis. Technyflex® Feline Premium Joint Supplement offers a safe, effective, all-natural way to relieve the pain and inflammation caused by joint disease and arthritis. Made with just one ingredient – 100% New Zealand Greenlipped Mussel – Technyflex® is packed with inflammation fighting omega-3 essential fatty acids along with glucosamine and chondroitin for healthy joint cartilage. So, if you are looking for a way to help your cat feel better and move better, why not give Technyflex® Feline a try? Exclusive 20% discount for Conscious Cat readers: Use code Discount code is MERRY20, valid through December 31, 2017. Smalls is real food for cats that’s homecooked by humans, customized for your cat, packed fresh, frozen, and delivered to your door. Finding honest, high quality meals can be tough, but Smalls makes it easy. Your furry friend is sure to love Smalls’ nutrition-loaded and vet-developed recipes, made with 100% human-grade and cat-approved ingredients (without fillers, grains, or preservatives). Ready to give the gift of real food and healthier living to your purrfect pal this season? Head over to smallsforsmalls.com and get 50% off your first week. For more information and to purchase, visit http://www.smalls.com. Personalized and autographed books make wonderful holiday gifts, and I’d be happy to gift wrap and ship directly to the recipient for you. To order personalized, autographed copies of my books, please contact me via email. FTC Disclosure: This gift guide is sponsored by the participating vendors, which means that the businesses featured in this post paid me an advertising fee. Regardless of payment received, you will never see products or services featured on this site that I don’t either use or would use myself. Some of the links in this gift guide are affiliate links, which means if you purchase something by clicking through on one of these links, we will receive a small commission. Thank you for all the time and effort I’m sure it took to put this together! I discovered a few things I hadn’t known about and would like to try. I hope your holiday season is lovely and peaceful. I’m glad you enjoyed our gift guide, Lisa! The Wet Whiskers coupon code is not working, unfortunately. Is there an updated one by chance? Let me check with the company and I’ll get back to you, Jessica! Thanks, to you, and the girls for compiling the list. Do enjoy going through it.